Atiku Abubakar has revealed that he jogs more than a mile everyday, and urged Nigerians to vote for him on the basis of his ability to deliver and not as a result of anything else. 2019 presidential hopeful, Alhaji Atiku Abubakar, on Wednesday, revealed that he wants Nigerians to vote for him, not because he can walk but because he can work. 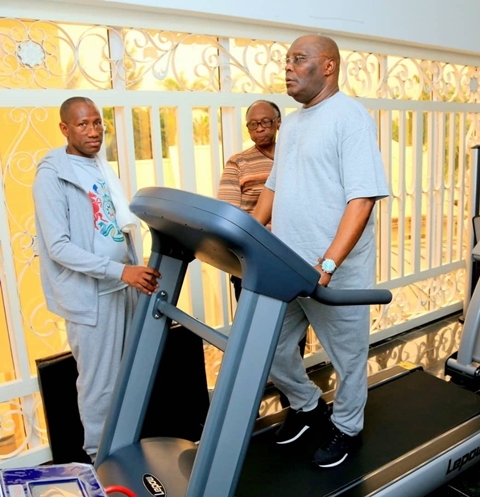 Atiku said this via his verified Twitter handle, @atiku, when he shared a photo of himself on a treadmill. The social media was awash on Monday after the president's handlers and the ruling party, All Progressives Congress, sang praises on President Muhammadu Buhari who walked 800 metres from the mosque to his house in Daura as proof that he was fit for the 2019 election.